Construction companies move from job site to job site using the materials available in that specific area to design and produce their own concrete. Over the years many different aggregate proportioning techniques have been used to create a concrete mixture. Aggregate can be proportioned by volume, minimum voids, and gradation. Furthermore, a well designed and economical mixture will effectively use the aggregate to reduce the amount of paste in a mixture, but still achieve the required workability, which is called optimized graded concrete. Many conflicting reports have surfaced about the success of different aggregate proportioning methods. Other than field experience, a very limited amount of useful data has been presented on the subject of aggregate proportioning for concrete mixtures due to the inability to measure the workability of concrete for the specific application. This difficult proportioning task can be very complex because the gradation, shape, and characteristics of the aggregate changes in every the local geology region. Several theories have been presented over the year and can be categorized into five aggregate proportioning techniques. Volume or Weight- Proportion a certain volume percent or weight values for aggregate such as 3:2:1 and 60% coarse aggregate/40% fine aggregate. Maximum Packing Density- Proportioning aggregate based off the maximum voids content of the aggregate blend. These include dry-rodded unit weight and various analytical models. Range of Voids Content-Proportion aggregate based off a certain range of voids content. Surface Area- Minimum amount of specific surface area (SSA) will give the most workable concrete. The more popular methods for proportioning aggregate in slip formed pavements was used. These methods include the Shilstone Coarseness Chart, Individual Percent Retained Chart, Power 45 Chart, and 60% coarse aggregate and 40% fine aggregate. Below is a brief overview of each method. In general the 60/40 method is the most typical design method for concrete in general. Similar to the 1:2:3 volume method, or variation of this method, the 60/40 method is based on the percentage of rock and sand volumes, which are roughly 60% coarse aggregate and 40% fine aggregate by total volume. These volumes can be slightly adjusted for better workability. However, the theory overlooks the gradation effects on the workability of a mixture and doesn’t account for the intermediate contained in both the fine and coarse aggregates. For our research we chose the 60/40 method because it's the most common aggregate proportioning method and also like previously stated, it does not take into account the effects of gradation. This can really shed light into the determining if the gradation really effects workability. Starting in the late 1980s, James Shilstone revealed a mixture design process based on the proportioning of the aggregate using the combined gradation to proportion a group of sieve sizes that can be categorized as coarse, intermediate, and fine aggregate. He designed a chart and two proportioning equations from 20 mixture designs in Saudi Arabia and confirmed the chart and equations using aggregates from the Dallas, TX area. From Shilstone’s experiences, he determined the workability could be sufficient in certain areas of the chart and divided the chart into zones as shown below. Also, two different equations were developed for proportioning the aggregate by groups. 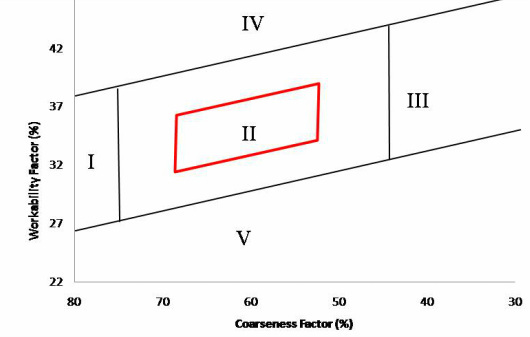 The coarseness factor proportions the percentage amount of coarse to intermediate and workability factor proportions the percentage amount of sand plus cement to coarse and intermediate. To use the Shilstone Coarseness Chart, one must select a point in the chart and back calculate to find the proportions of aggregate. However, the zone where the point selected reflects the different proportioning properties. While Zone I is supposed to be gap graded with very little amounts of intermediate, Zone II is supposed to be well-graded and the location of the optimal gradation for a concrete mixture design. Zone III has a large majority of intermediate and very little coarse aggregate. The Zone IV and Zone V correlate with the extreme sandiness and rockiness. A large focus has been to use multiple regions of zone II for certain applications. Many DOTs use a parallelogram in the middle of zone II for a requirement of aggregate proportioning in slip formed pavements. However, Shilstone suggested bottom of zone II would best for this application. Unfortunately, little testing data has been published by Shilstone or others to validate the chart. Started in the concrete industry in 1907 and now used by the asphalt industry, the power 45 curve uses a combined gradation to best-fit to a straight line on the cumulative percent passing chart (Fuller and Thompson 1907). The straight line from the origin to the nominal maximum size has thought to be the maximum density of a combined gradation, which supposedly creates the maximum density and the minimum amount of voids in a mixture. 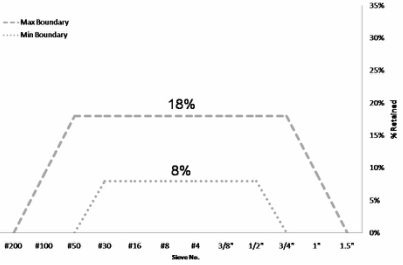 A method for evaluating the each exact distribution of each sieve size has been the individual percent retained chart. 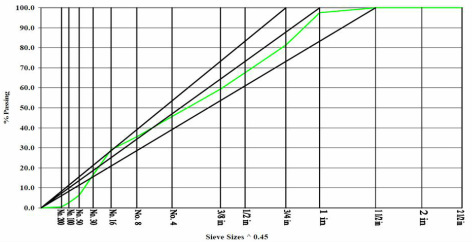 The chart can easily show the excess or lacking sieve sizes of a combined gradation. From experiences, people have specified a maximum boundary of 18-22% and a minimum boundary of 5-12% retained on each sieve. No known research has been conducted to prove the limits. Since an established and quantitative method to proportion aggregate is not out there, our research team investigated some of the more popular aggregate proportioning methods and compared the workability performance of each mixture. Mixtures were designed with a fixed amount of paste but using different aggregate proportioning methods for slip formed paving and also typical ready-mix concrete. With three sources of sand, five different sources of crushed stone, and two river gravel sources, we have test over 800 mixtures. Many monumental findings have been made in the workability effects on the proportioning of aggregates.